Although it might seem that my newly published book on Dominican lay brothers (now called “cooperator brothers”) would have little to do with liturgy, it, like my book on the religious life of the medieval Italian cities, Cities of God, actually has a large liturgical component. In Dominican Brothers: Conversi, Lay, and Cooperator Friars (Chicago: New Priory Press, 2017), I discuss the pre-Vatican-II “Office” of the brothers, that is, their recitation of differing numbers of Pater nosters during their attendance at the clerics’ choral office, the forms of their suffrages for the dead. and their sacramental and ritual life. In addition, I trace their work as the architects of churches, most famously of Santa Maria Novella in Florence, and as sacristans. For the early modern period, I trace the central role of the brothers in introducing the common recitation of the Holy Rosary by all the friars in choir. The book also includes behind-the-scenes descriptions of the debates on the transition from the Latin Divine Office to the nearly universal use of the vernacular, in which the desire to involve the brothers more directly in the liturgical life of the Order played an important role. For this part of the history I draw on unpublished documents in the General Archives of the Order in Rome. In addition to liturgy, the book describes many other activities of the brothers in social service, the missions, maintaining our houses, and teaching, as well as their countless martyrs in Asia, Eastern Europe, and during the Spanish Civil War. 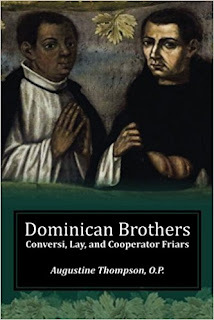 The image on the cover shows the two most famous Dominican brother Saints, Martin de Porres on the left and Juan Macias on the right. This book would make a very suitable Christmas gift for any Dominican priest or brother. Dominican Brothers can be ordered here.